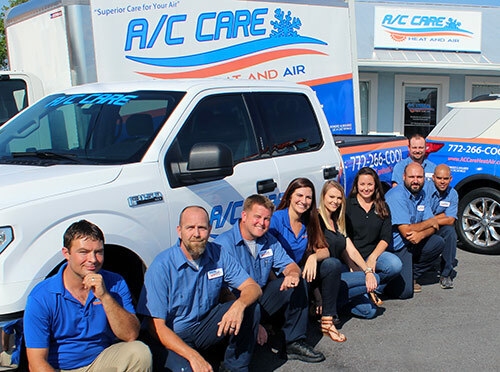 We’re your trusted company for A/C repair in Port St. Lucie. Whether you need residential a/c repair or commercial HVAC and air conditioning service, we’ve got you covered. Our licensed and insured team provides installation of new air conditioners, replacement of old air conditioning units and installation of state of the art air quality systems. It’s our mission to ensure that your living or work space is properly temperature controlled. We provide professional HVAC maintenance services and repair. We keep your home and office comfortable in the beautiful warm Florida weather. A/C repair or installation, we stand behind our work. We won’t rest until the job is complete to your satisfaction. Have you ever taken the day off work to wait for a technician to show up, and then he doesn’t? Our licensed technicians arrive on time a ready to repair your air conditioner. You don’t just need your air conditioner during business hours. That’s why we’re available 24/7 for emergencies. Keep your A/C running efficiently and avoid break-down in the middle of Summer. Have it inspected, cleaned and tuned-up. There are many factors to consider, however you can start the process of improving your indoor air quality by asking these questions. Ensure your family stays happy and healthy. Learn about your indoor air quality here. Don’t let your faulty businesses A/C system distract your employees from being productive. Learn more about commercial HVAC services. Give them a call with any of your a/c or heating concerns and know that you are getting the best of the best!!! The entire staff that replaced my system was very professional in every aspect. Can’t say enough great things about this company. 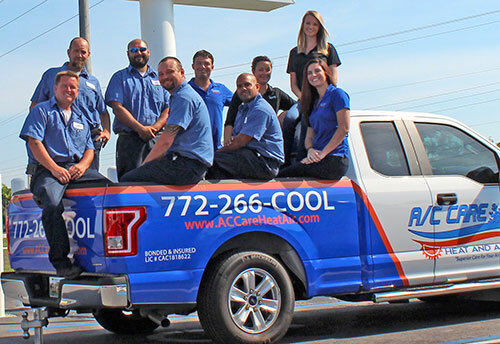 Locally owned and operated, A/C Care Heat & Air takes pride in providing professional Air Conditioning Installation, Air Conditioner Service, and A/C Repair. We’re here for you in Port St Lucie 24 hours a day, 7 days a week. We offer the finest A/C brands, such as Lennox, Goodman, Rheem, American Standard, GE, Bryant, Carrier and many more. All installations and repairs are performed by trained & experienced Air Conditioning technicians. Our technicians carry parts for all makes and models on our trucks. In most cases, we diagnose and provide AC and heating repairs on the spot. Our friendly staff and uniformed technicians are here to help you get comfortable as fast as possible. In addition to residential A/C repair, we have the expertise and equipment needed to get your commercial HVAC functioning quickly. Call us today at (772) 266-2665 for Air Conditioning Service, A/C Installation or AC Repair and Commercial HVAC services in St. Lucie County. Thank you for choosing A/C Care Heat & Air for your air conditioning services.